Click for the look ahead. 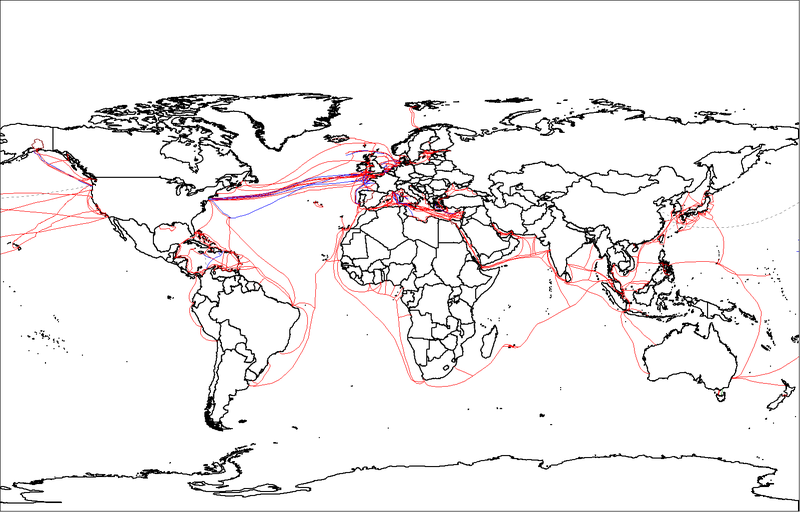 International submarine fiber optic cables traverse many of the same routes that sailing ships followed in centuries gone by. In one sense, that’s not such a surprise. If goods move between the U.S. and Britain, say, then information is going to flow that way to something like the same extent. Even so, an interactive graphic on Vox.com brings that relationship to life in a fascinating way, by combining a shipping map from 1912 with the latest edition of Telegeograhy’s submarine cable wall map, published retro-style with everything except Here be Dragons included. It also says something about the way the world has changed in the past century. In 1912, transatlantic trade routes also included regular service between commercial centers of colonial empires. Those kinds of direct connections to developing countries are much rarer today. Cable routes are now centered on the U.S. and a handful of other hubs in developed nations, although that’s slowly changing, partly due to growing demand and partly to concerns about any particular country having too much control over, and access to, international data traffic. One of the exceptions is the Atlantis-2 cable that links Brazil and Cape Verde Islands with former coloniser Portugal, as well as locations on the African continent. A new route, the South Atlantic Cable System, is slated for 2017 and would bring lusaphone Angola into the fold. Other cables are planned between Brazil and South Africa, and directly to Portugal, again following centuries old trade routes. If you want to know where submarine fiber is likely to be laid over the next decade, just pull out an old sailing chart.